Is India’s Regional Influence on the wane? 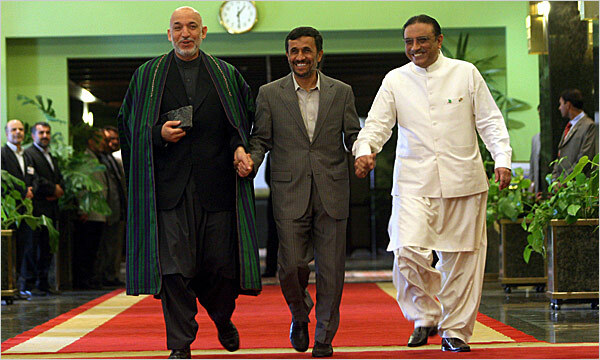 President Mahmoud Ahmadinejad of Iran, center, with President Hamid Karzai of Afghanistan, left, and President Asif Ali Zardari of Pakistan [Photographed May 24, 2009] With Pakistan and Afghanistan fighting the radical, Islamic insurgents, the meeting seemed designed by Iran to assure its neighbors that working together the three could solve their problems without having to rely on the West. In recent weeks, lot of things were happening in the Afghanistan-Pakistan theatre which are critical to the evolution of India’s regional role and its foreign policy. On 26 February 2010, at least nine Indians, including three army officers were killed in a terrorist attack in Kabul. The attack was carried out focussing the residential areas used by Indians working in Afghanistan. The Indian National Security Advisor, Mr. Shiv Shankar Menon made a two day visit to Kabul on 5 March 2010 to review the security situation of the Indians working there. 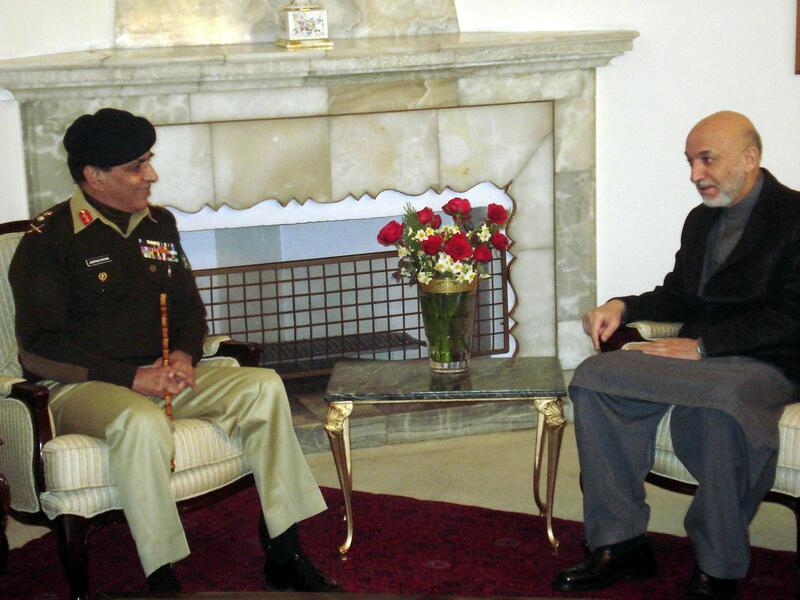 Following his visit, Pakistani Army Chief General Pervez Kiani met the Afghan President, Hamid Karzai in Kabul, on 6 March 2010, to discuss “matters of mutual interest”. On 7 March 2010, the US Defense Secretary Robert Gates carried out an urgent visit to Kabul. This was in view of the scheduled visit of the President of Iran, Mahmud Ahmadinejad on 10 March 2010. The Iranian president’s visit was aimed at showing their strong support for President Karzai and to secure Afghan support. This was followed by a two day visit by President Karzai to Pakistan on 10 March 2010. During this visit, Karzai held talks with his Pakistani counterpart, President Asif Ali Zardari and also had a separate meeting with Pakistani Army Chief, General Kiani. Indian government officials and strategic thinkers till now took Indian influence in Afghanistan for granted. They dealt with Afghanistan as an Indian outpost, using it to monitor Pakistan and to secure India’s national interests. Following the London conference on Afghanistan in February 2010, while the international community accepted the idea of involving moderate Taliban in the political settlement, India vehemently opposed it. India always remained cynical about involving Taliban in the Afghan national reconciliation process. India’s opposition is based on the ground that there is no difference between a good and bad Taliban. The geopolitical reason behind this Indian opposition is that, if Taliban is involved in this process, then it will become inevitable that, Pakistan will play a major role in the formation of any future afghan government. In addition, during his talks with Gen. Kiani, the Pakistani army chief offered him to train the Afghan army. To this Karzai said, “as far as the training of Afghan soldiers, my minister of defence will study and we will come back on this”. All these developments are not fitting well with the plans envisioned by the Indian strategic thinkers. India has no one else to blame for this predicament other than itself. India lost its influence over Karzai following its miscalculated backing of the opposition candidate, Abdullah Abdullah, fielded by the US and also having failed to support Karzai in the recent months. It is evident that in the coming weeks, President Karzai will be working closely with Pakistan to ensure that the “Loya Jirgha” ends successfully. Iran was one of India’s long standing allies in the region over decades. However, during its flirtation period with the Bush administration, the Congress led United Progressive Alliance (UPA) government (2004-2009) in Delhi forfeited this special relationship. In January 2003, under Prime Minister Atal Bihari Vajpayee, India and Iran signed a landmark agreement known as “the Delhi Declaration”. As per the declaration, “the combat against international terrorism should not be based on double standards. States that aid, abet and directly support international terrorism should be condemned”. The declaration added that in the field of oil and gas, the two sides would formulate a joint mechanism to promote cooperation. Prime Minister Vajpayee added that the joint India-Iran initiative to develop the Chahbahar port in Iran and to connect it to Afghanistan by road have started a new trend of investment in infrastructure development. During this period India was considering the construction of a pipeline from Iran through Pakistan, commonly know as the IPI (Iran-Pakistan-India) pipeline. This was the high point in the Indo-Iranian cooperation. The first major blow to Indo-Iranian relationship came on 24 September 2005, when, for the first time, India voted against Iran at the International Atomic Energy Agency (IAEA) meeting in Vienna. The Indian government declared that “decisions are taken in conformity with our stated foreign policy and also in the interest of India and the world”. Iran was surprised by India’s vote against it. Following this, Ali Larijani, the secretary of the Supreme National Security Council of Iran said that “India was our friend”. India voted against Iran at the IAEA to please the Bush administration to continue with the plans for a civilian nuclear cooperation between India and the US. In October 2008 both sides formally signed the civilian nuclear deal. However, since Barack Obama came to power in November 2008, the deal remains unimplemented due to his reluctance to the transfer of “dual-use technology” to India. In November 2009, India once again voted against Iran at the IAEA. Any chance of placating Iran was lost with this gesture. Countries like Brazil, South Africa, Pakistan, Afghanistan, Egypt and Turkey abstained from the resolution. It is interesting to note how countries like Pakistan, Afghanistan and Turkey have been successful in maintaining their cordial relationship with the US and Iran at the same time. The Indo-US relationship reached a new height during the UPA led government in Delhi and the Bush administration in Washington. This period saw a continued increase in Indo-US cooperation in many fields. The glorious hour of Indian diplomacy came with the successful signing of the ‘Indo-US Civilian Nuclear Agreement’ in October 2008. However, one thing which Indian strategic thinkers missed out was that it was also the starting point of the declining graph of Indo-US Cooperation. Since Barack Obama came to power in November 2009, the US administration have not shown much enthusiasm in going ahead with the nuclear deal. Honouring President Obama with the 2009 Nobel Peace Prize for his promotion of nuclear non-proliferation also have further complicated this issue. After coming to power, President Obama had not been in a hurry to warm up relations with India. The Indian government and the Indian strategic community were lost in every sense, at this new posture taken by the US administration. Faced with the economic crisis back home, war in Afghanistan and the rise of Taliban in Pakistan, his priorities lie elsewhere. India no more enjoys the equal status it enjoyed under the Bush administration. For Obama, priorities are Afghanistan, Pakistan and China in the region. Indian policy makers and strategic thinkers misinterpreted the fact that Pakistan is US’s major non-NATO ally in the region and also underestimated Pakistan’s influence over the US policies in Afghanistan, Pakistan and Central Asia. India’s obsession with China as its greatest security threat dates back to its defeat in the 1962 war with the Chinese. Since then, China has remained a hot topic for Indian diplomats, military strategists, policy makers and researchers. It is a fact that China is a threat to India, but not to the extent to which they are being projected by the media. From the Indian point of view, all these Chinese development projects in the region are part of the larger Chinese plan to encircle India. For Indian military analysts and policy makers, the Chinese are everywhere in the region, including the Indian Ocean, which India has traditionally considered as its sphere of influence. The encirclement of India with ports, also known as ‘the string of pearls’, can be looked at from another perspective. Chinese are trying to safeguard their national interest and protect its economy. China’s dependence on imported oil and natural gas has led it to think of possible openings in this part of the world, rather than depending completely on the Malacca Strait for the passage of its vessels. They are trying to protect their back. In case of a future conflict with the US, China does not want the US to be successful in blockading its shipping lane. The reason behind developing ports in the Indian Ocean is to ensure continued oil and energy flow to China. It is wrong to interpret the increased Chinese presence in the Indian Ocean as the result of their obsession to encircle and monitor India. China will never be ready to give that much predominance to Indian military capabilities. The Chinese have never considered India as a major power or a threat. It considers India as a regional player. On the geopolitical map, the US is their only contender. By projecting China as its greatest menace, it is India who is loosing in the Great Game nations play. India needs an approach to deal China diplomatically. Since the 1990s the relationship between India and its long time ally and friend, Russia, has declined considerably. Changes in the government, economic policies and ideologies resulted in this drift. 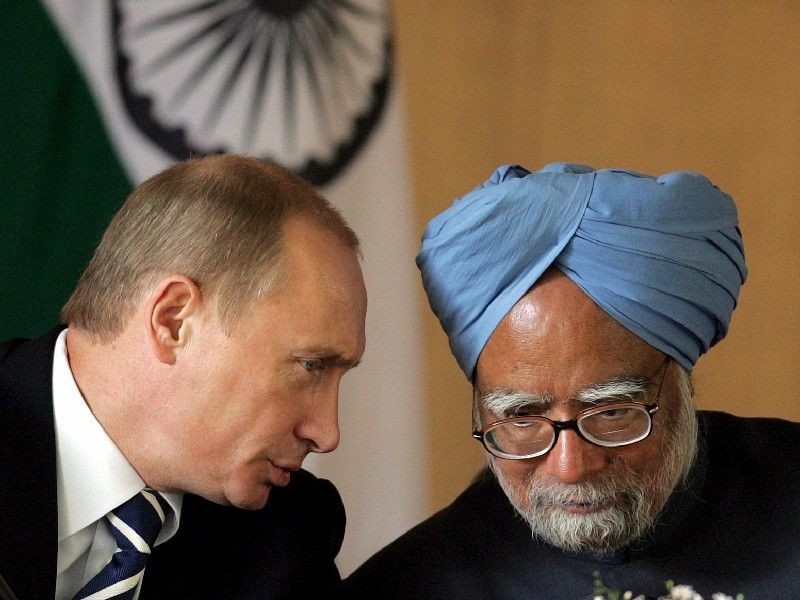 India’s leaning towards the US during the Bush administration has led to a weakened relation with Russia. But, with the visit of the Russian Prime Minister, Vladimir Putin to India on 12 March 2010, both sides are trying to reset this. During this visit, Putin successfully secured a list of agreements and contracts. 1: $1.5 billion deal for the supply of 29 additional MiG-29 Fulcrum D-based fighter aircraft. 2: An agreement to sign a contract on the joint development of a new fifth-generation fighter. 3: A revised deal of $2.3 billion on the upgraded Admiral Gorshkov aircraft carrier. 4: Deals to establish a joint venture to produce navigation equipment for GPS (global positioning system) and its Russian equivalent Glonass, and the use of Glonass signal for military use by India. 5: Agreements for the construction of up to 16 nuclear power plants in India worth tens of billions of dollars. These contracts and agreements signed by both sides will play a vital role in increasing India’s cooperation with Russia. It is to be noted that, during Putin’s one day working visit to New Delhi, which did not include any state dinner, he went ahead with offering India with the technology and partnership that India had been looking for over the years, from the US and other western powers. Hopefully, this new boost in Indo-Russian relations can help to change the US centric mindset of the Indian strategic community and policy makers. It is a fact that whichever government is in power in Delhi, be it the ruling Congress Party or the opposition Bharathiya Janata Party (BJP), India’s foreign policy remains US-centric. Even India’s strategic community is so obsessed with “America” that any future policy making, independent of US influence and aiming at India’s national interest would be a difficult task. Allowing India’s diplomatic relations to be controlled or reviewed by other countries like the US or the European Union, will only undermine India’s capacity to project itself as a rising power. Looking at India’s geopolitical priorities and the policies and actions taken to achieve it, it is clear that India’s diplomatic capabilities are not very ingenious. It is important to learn from history and experience, rather than repeating the same mistakes again. India has to start engaging with countries with which it have limited contacts or strained relations. At this point, it is important for India to concentrate on improving its relations with Russia, China, Iran and other countries in Asia, Africa and South America. It is important that India engages closely with China, Iran and Russia on issues relating to regional security. All these countries have stakes in Afghanistan. Afghanistan should be taken as a common point to start communicating with these countries. India’s tailing of the US policy in Afghanistan is a barrier in conducting overt dialogues with Iran, China and Russia on regional security. Pakistan is cleverly using this Indian inability to strengthen its stand with all the other important players in the region. India can use regional groupings like South Asian Association for Regional Cooperation (SAARC) and Shanghai Cooperation Organisation (SCO) as platforms to discuss regional security issues. India has to make a clear and concerted approach in framing an independent foreign policy. Even though it might hurt some of India’s close allies, in the long run it will only strengthen India’s position on the international stage. It will demonstrate India’s independent policy making capacity, to protect its vital national interest. India has successfuly maitained a balance during crucial Cold-war period in its foreign policy .Now when there is no Berlin wall India can easily walk in entire Europe without any hesitation from Mosco to Lundon.Our regional interest is less than international interests .We are also not in confrontation with China.but in contrast to it we are in the process of complementary relation with her, which is being paved by many peace loving forces of the world .Our relation with Iran has been economical and will remain so many more years to come but when unification of basics will again emerge due to regional geopolitical changes in near future , the aparant rift in relation will get evaporated .Thus we have a time – tested foreign policy for we have paid the required cost during cold war era . The SAARC will have to get its shape under the shadow and shelter of India to survive.The demand for keeping away the foreign players in the region will gradualy increase in future .That will open a new canvos for Indian foreign policy .